Made with durable high density nylon webbing and fine stitching. Already tired of the dull and gloomy colors? These bright colors are made to brighten up your kittens’ wardrobe. Classic but simple, Blueberry pet’s new classic collection cat collars are perfect for everyday wear. While breakaway clasp is designed to make more safety and care to your kitty, there is one more stunning feature of this collar – the maximum lovely bow tie. 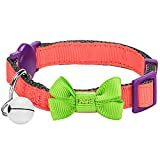 No kitties should miss this safe yet lovely cat collar. This new design is available in 4 colors, raspberry, Fusion Coral, fluorescent yellow and fluorescent green. Can be used on pets for stopping/reducing barking,chewing and biting. 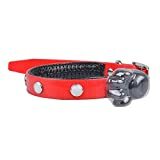 Adjustable with buckle and strap,convenient for you to adjust according to the head of the pet. 2.Can be used on pets for stopping/reducing barking, chewing and biting. 3.Avoid or control the pet from eating junk food outside. 4.Adjustable with buckle and strap,convenient for you to adjust according to the head of the pet.